Single Incision Laparoscopic Surgery: What Do Patients Really Want? Recent modifications to instruments and technique have allowed for more procedures to be performed with fewer scars, and single incision laparoscopic surgery has become a focused topic. Experimentation with single incision surgeries has been called a patient-driven phenomenon by many proponents, but there is a paucity of evidence to support that claim. Before investing in the initial increased operating time and expenses from new equipment it would be interesting to determine if patients really want this, realizing that single incision surgery involves a larger incision with the potential for greater pain and complications. 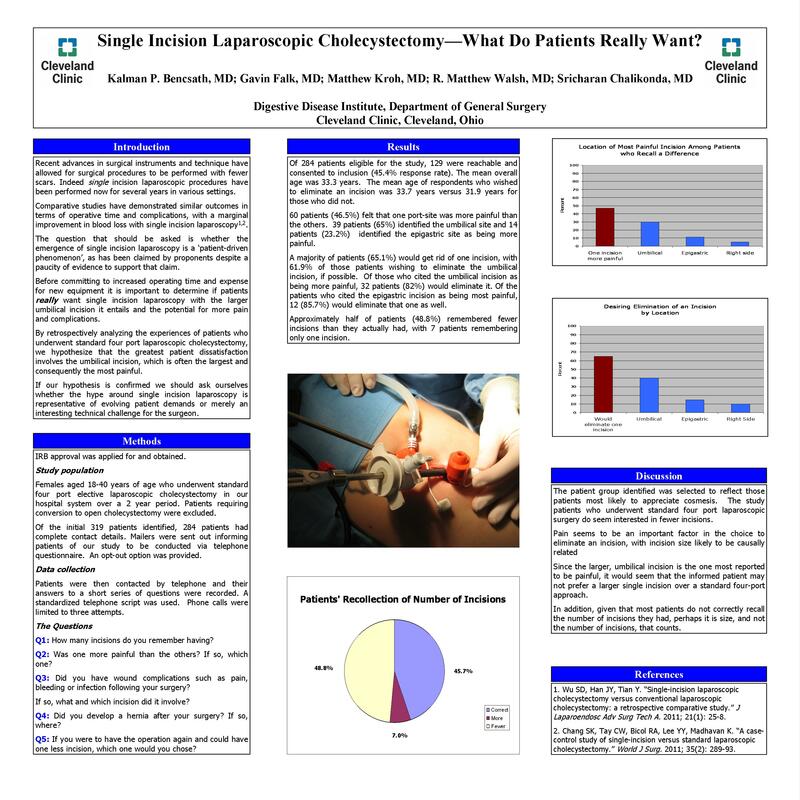 Looking retrospectively at the experiences of patients who underwent standard laparoscopic cholecystectomy, we hypothesize that the greatest dissatisfaction involves the umbilical incision, which is often the largest and most painful. Should patient responses indicate that, one might wonder whether the investment will pay off. IRB approval was obtained. Female patients aged 18-40 years of age who underwent elective laparoscopic cholecystectomy across our hospital system over a 2 year period were selected as the study population. Patients requiring conversion to open cholecystectomy were excluded. Study patients were contacted by telephone and answers to a short series of questions were recorded. A total of 319 potential study subjects were identified. At the time of submission, data was collected from 25 patients and is summarized in table format. Roughly half of patients studied identified the umbilical incision as being more painful than the others, and a majority of patients would want to eliminate that incision. All patients wanting to eliminate the epigastric incision had a 10-11 mm port at that site. More than half of patients remembered fewer incisions than they actually had, and one patient remembered just one incision. Interestingly, one patient who had a single incision laparoscopic cholecystectomy who was inadvertently included incorrectly remembered having three incisions. No patients reported wound complications such as infection or hernia. The particular patient group identified was selected so as to reflect those patients most likely to appreciate cosmesis. The study patients who underwent standard four port laparoscopic surgery do seem interested in fewer incisions. However, pain and the size of the incision seem to be the biggest factors in the choice of which incision to eliminate. Since the umbilical incision is the one most reported to be bothersome, it would seem that the informed patient would not prefer a larger single incision over a standard four-port approach. In addition, given that most patients do not correctly recall the number of incisions they had, perhaps it is size, and not number, that counts.